He subsequently went to Johann (John) Sutter, the owner of the mill and a nearby fort (which incidentally was the first non-Native American community in California’s Central Valley, about 40 miles away from the mill) and showed him what he had found. The two had it further tested and confirmed it was gold and, not only that, it was 96% pure (23 karat). Sutter was not happy about the discovery of gold on his land as he foresaw the end of all his plans to develop an agricultural community and thriving business. As such, he attempted to keep this discovery a secret at first, but was obviously unsuccessful. Soon Sutter’s worst fears came true when squatters showed up from all over, breaking his fences down, stealing his cattle, and destroying his crops. In the end, Sutter ended up dying fairly poor, having never found a way to profit from the discovery of gold on his land and having failed in other later business endeavors. At first, the Gold Rush was more of a trickle with people coming down from Oregon and other nearby areas. These “48’ers” tended to fare much better than subsequent Gold Rushers as initially it wasn’t terribly hard to find relatively large amounts of gold in this region. Indeed, it is estimated that the average 48’er took in daily about 10-15 times the average daily wage for a worker at that time. Also, because there were initially few laws in the area at the start of the Gold Rush, people weren’t restricted to one plot of land and could simply search until they found some gold, rather than concentrate on one claim. 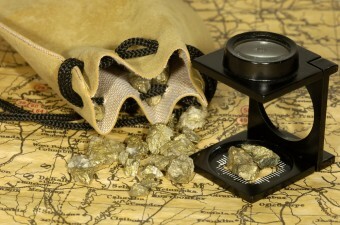 By August of 1848, the New York Herald reported the discovery of gold in California and others soon followed. President Polk fanned the flames in December of 1848 when he addressed congress and announced that gold had indeed been found in California. Over the next seven years approximately 1/3 of a million people moved to California as a result of the Gold Rush. This was no small thing at the time as California wasn’t the easiest place to travel too with the transcontinental railroad not being built until 1863; so anyone from the Atlantic side of the U.S. and world needed to either make the grueling journey by land or go by sea, traveling all the way around the tip of South America or through the jungles of Panama to shorten the voyage. Interestingly, despite the fact that an estimated 15 million ounces (nearly $25 billion of gold by today’s prices) was collected in California during the Gold Rush, merchants actually made more money than the miners themselves. One notable example of this is a name that is still familiar to this day, Levi Strauss, who owned a dry goods store in San Francisco and introduced his durable denim overalls to prospectors around the middle of the Gold Rush. I found this website handy for my report on James Wilson Marshall and the history of the California Gold Rush.